You are currently browsing the tag archive for the ‘moxon’ tag. I’m happy to announce the completion of my workbench! I call it the “Reject Roubo” as it was constructed almost entirely out of reject lumber that was given to me by a church friend whose husband runs a timber export business. I bought the big wooden screw for the leg vise ($10), and the glue, and that’s pretty much it. 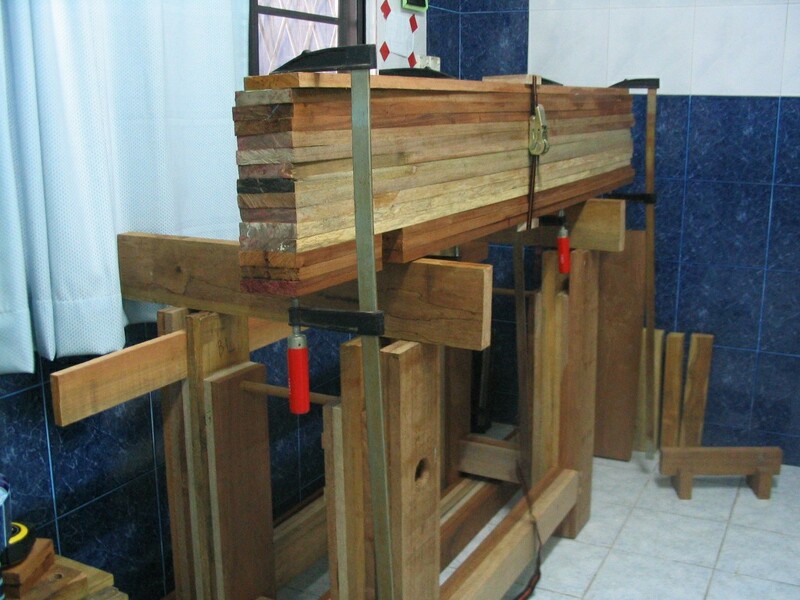 December 2007: I purchase my first bunch of boards for what the top of what I believe was to be a Roubo-style workbench. I never finished prepping these 16 boards. 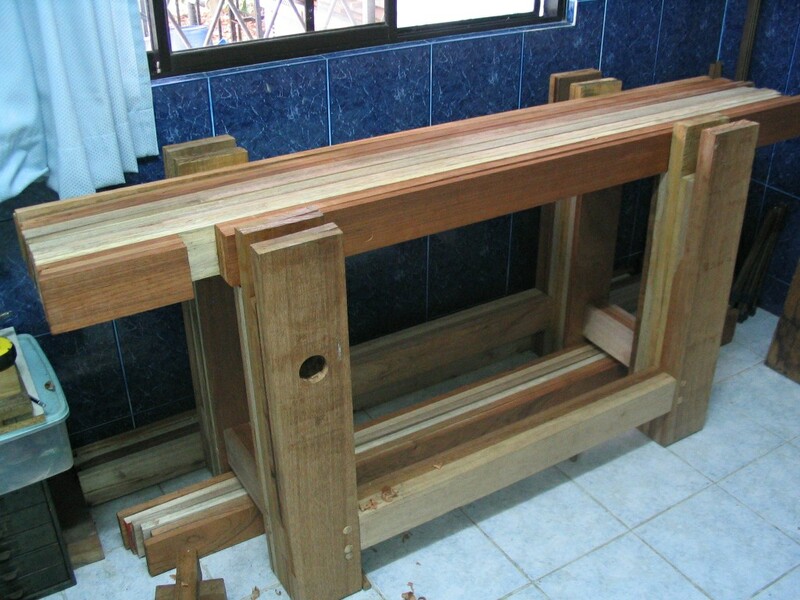 May 2009: Now in a different home, I start pondering afresh how I’d build my Roubo workbench. 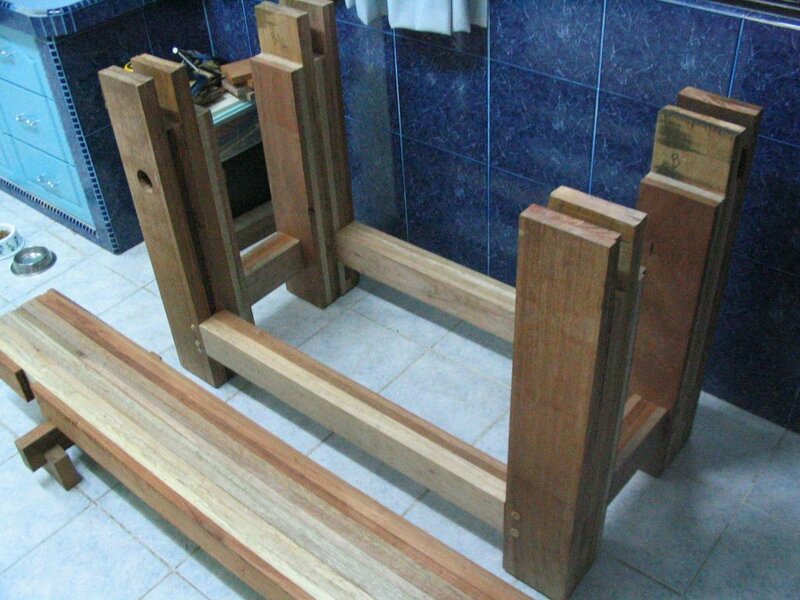 June 2010: I receive free lumber and have no excuse! 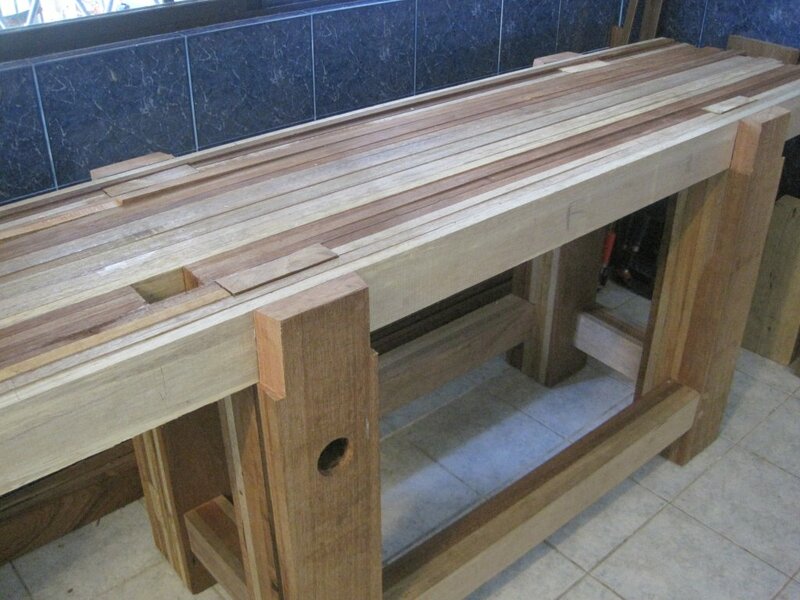 May 2011: I declare the bench completed (as in entirely assembled), and stated that within the week I expected to complete the flattening of the benchtop. September 2011: I request a kick in the pants. 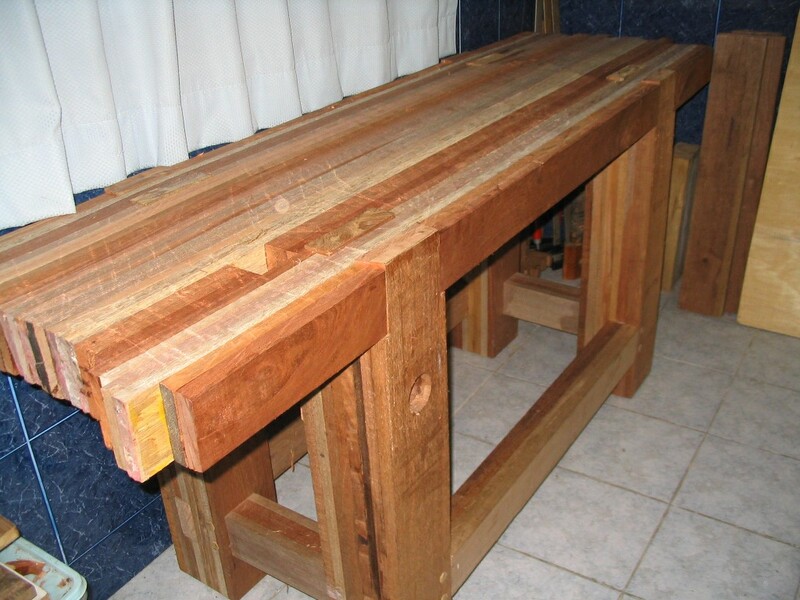 October 2011: I finally get going, and indeed, finish the bench in virtually no time. So that is about 4 years from start to finish. About a year and a half on this current iteration. But it’s done. Pics! Still waiting on my oil to entirely dry. 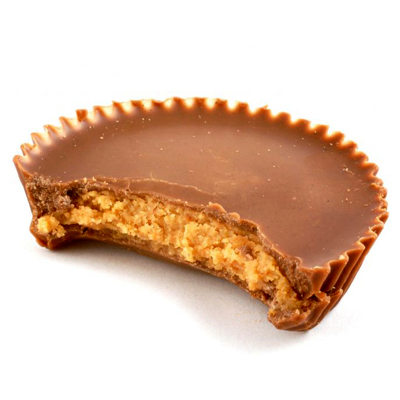 The nut is actually not glued into the leg at all; it’s merely held in place by those blocks that are screwed into the leg. So anyway, you can see that there are only a few inches of thread, and I suppose that’s why the screw does not remain perfectly horizontal. So I had in mind to glue a handmade wooden washer in the front of the leg’s vise hole to give some support to the screw. My brilliant wife said, “Why do a whole washer? Why not just glue little bits on the bottom since that’s where the support is needed?” She gets it, folks! And voila! my big wooden screw definitely is receiving much more support and is much more horizontal when in use. It’s amazing how close I was to being done the past several months. If you go back and look at my archives (don’t worry about it, I’m about to sum up), I didn’t make ANY progress from May to October because I dreaded the flattening and leveling that I needed to do. Once I got over that hump, I made ginormous strides in no time. And you know what I did today? I put my first coat of BLO on it. My bench is literally finished. I still have all the parts (leg vise, planing stop, etc.) separated so it’s not assembled. But tomorrow I will have a fully-functioning workbench. So I’m content. Enough. Next I’ll take my #7 plane over the whole thing and then comes the smoother. Well the separate paths of motivation and free time finally merged today for a couple of hours, and I was able to get my jack plane out and get busy! I am about 3/4 of the way through “Phase 1” which involves getting the whole top flattish. Then I’ll drop it back down (you may be able to see it’s “up on blocks” (literally) to keep the top clear of the leg tenons) and see how level it is. If it’s pretty close to level, then I’ll smooth it up! If it’s much off (it was almost 1/4″ high in some places!) then I’ll get back to work on “Phase 2” and reassess. Hope to do some more tomorrow! Hey, Now That Almost Looks Like a Workbench. Today I lopped off the extra 1″ or so from the tops of the leg tenons (are those called horns? ), which was harder than I expected. Then I chopped the dovetails on the outer leg tenons, which was easier than I expected. In case you’re wondering, I started the cut with my dozuki and then when the back of the saw started hitting the top of the tenon, I switched to the rip side of my ryoba. Piece of cake, quite honestly. I’m going to glue up the last four boards (two on each side) while the benchtop is mounted, so I needed to apply a little wax a little here and there to be sure my next glue-up doesn’t fasten the top to the legs. And that’s that! 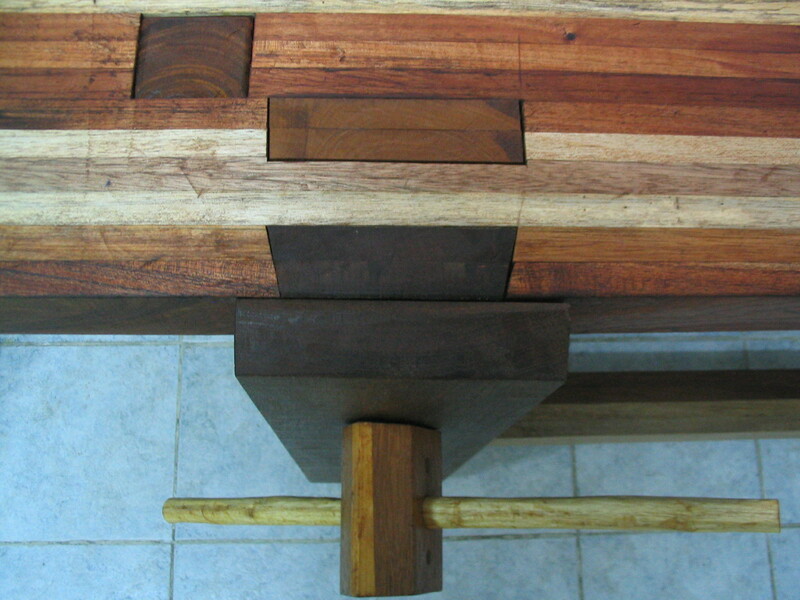 The tenons aren’t a perfect fit through the benchtop. You can see gaps here and there. But it’s also really snug here and there, and between the four legs the top is quite secure and immovable. So I’m okay with cosmetic imperfections. …the cow takes the cake. Not sure what that means, but it’s a saying in our household. It’s a strange household. I am making progress on the bench, but as before, I get hung up mentally when I come to big steps in the process. But first, a glimpse into how I do my glueups. After applying glue to both faces to be glued up, I place the new piece on the very top of the stack and clamp it with my 48″-ers, long side down. What appears to be a misalignment of that top board is actually a wicked bow in the last couple feet. More on that later. You’ll also notice that I had to elevate my work surface so that the clamps don’t hit the ground. After the clamps are on, I have to roll the whole thing over so that the top (new) board is on the bottom of the stack, so gravity can act as the “5th clamp.” I rest the whole setup on my sawing trestles and that’s it! Then I had to shim the area where the bowed board popped up. I glued a couple scraps in there (this is where the benchtop rests on the legs) and planed them level with the adjoining boards. Not too bad. The problem I have now is that the height of the bench is just slightly different at each corner. This is one of the pitfalls of working with wood that hasn’t been prepped to exact dimensions. On the one hand I saved myself a lot of time; on the other hand, I have to use some of that time to fix things later. So I need to figure out where to pare and where to shim. After that: cutting the leg tenons! A lot’s happened lately! I pegged the long stretchers. Funny story. 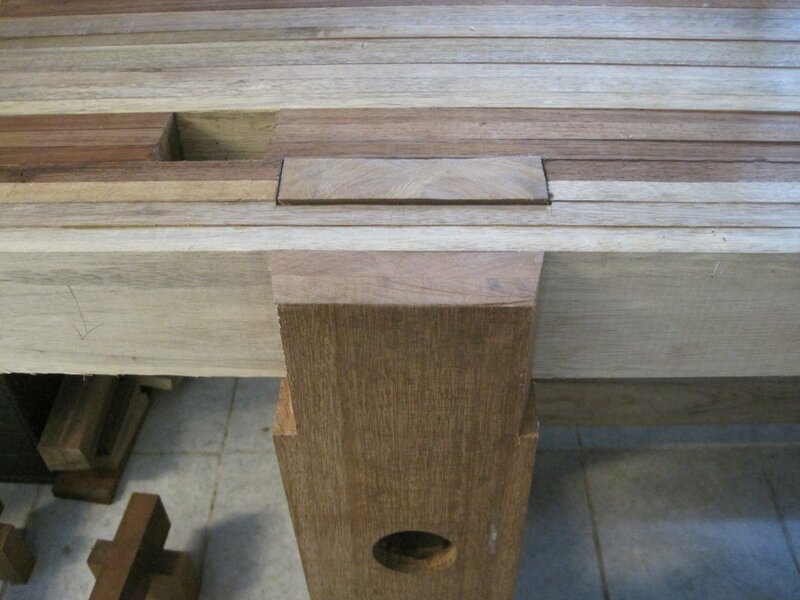 In my mind, the pegs in Schwarz’s Roubo were 5/8″. I didn’t have a 5/8″ bit, but I had a very nice 3/4″ one, so I used that and made 3/4″ pegs. I figure, maybe they’re a touch bigger than the ones Chris used, but hey, no biggie. Just the other day I realized: Chris used 3/8″ pegs!!! Haha, oh well, the Schwarz has said that you can’t overbuild a workbench, right? The only thing that went wrong is that I drilled the hole in the wrong spot for one of the pegs. In a show piece, that would have ruined my month. But hey, it’s just a workbench. I plugged the hole with a scrap of peg and did it again (you can see it in the front left leg). Then I glued up my interior 12 boards, which determined the length of my short stretchers. So I glued up my cut-to-length short stretchers and pared the tenons until they fit in the leg mortises. But here’s where I had problems. Somehow, the front and back leg mortises on the right were just misaligned enough that the stretcher was not wanting to go in all the way. I did everything. I laid the base on its back and jumped up and down on the joint. Literally, it was just like you’d picture a cartoon character jumping up and down on something, like a suitcase getting it to close. I squeezed all four of my 48″ clamps on it hoping to get it in. Finally I whittled a severe one-sided taper on a peg and hoped for the best. It worked! So while that joint might not be the best, it’s pegged and not going anywhere. If I’d used 3/8″ pegs, it would have never worked. And so now I have a base! Next step is to glue the next two boards on each side of the 12 you see in the picture. 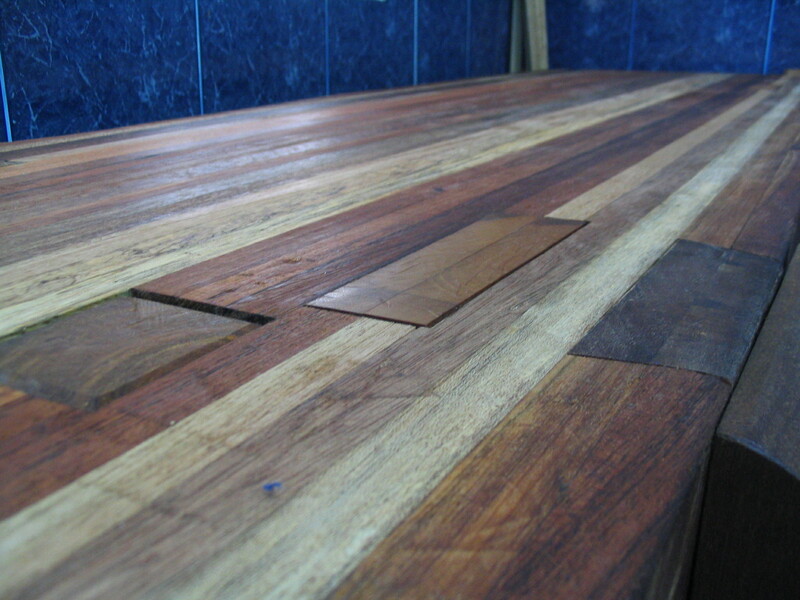 Then the benchtop, as it were, will be able to sit up on the legs. You can already see on the benchtop (far left of the pic) the start of the void mortise for the planing stop. It gets a little tricky here, as I need to figure out how to glue up the rest of the boards around the tenons. I only have 4 big clamps, and they’re not very good, so I don’t really want to just glue them up while the benchtop is in place on the base. So far I’ve been gluing up the benchtop on its side, with the newly-glued piece at the bottom, so the weight of all the other boards serves as a “5th clamp.” But this gets harder and harder as the top gets heavier and heavier, and it also involves constantly removing and replacing the benchtop on the base to check for fit. So here’s the bench mostly as I see it. My apologies for the faintness, but I think you get the idea. I forgot to put the crochet on there, so that would naturally be on the front left of the benchtop. You’ll also notice that I have no vises on the bench. I’m not entirely convinced that the bench needs them, although I do plan on making a removable twin-screw vise à la Moxon (not pictured). I had planned on installing a wagon vise, and have the hardware already, but when I included it into the sketch it just looked wrong. It rubbed me the wrong way, I can’t say why – maybe all those dogholes? If I regret it, I’ll retrofit it like The Schwarz did. I’m still up in the air about the leg vise. I can retrofit that too, although it’s a bit harder perhaps. I also ditched the sliding deadman. Sure, I might need something to support long boards for planing, etc. But I have no [easy] way to make grooves, so installing the sliding deadman would actually be one of the most complex parts of making the bench. And I just don’t feel like doing it. If I need something like that later on, I’ll hammer two pieces of wood together, with holes drilled in the vertical piece, and bam! – bench slave. So essentially I’ve taken most of the design of the Roubo, discarded the Schwarzifications of it (although the leg vise is also Roubo), and added a dash of Moxon. 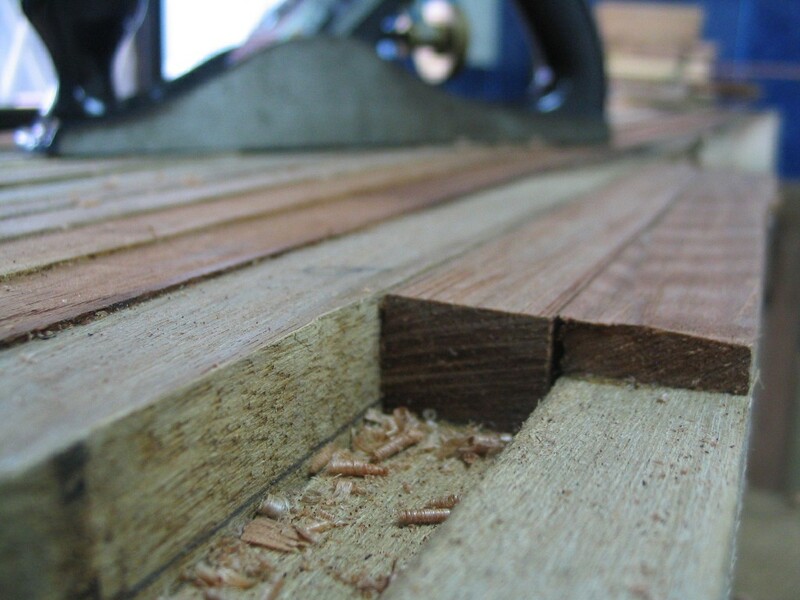 You Got Your Moxon in My Roubo! You Got Your Roubo in My Moxon! So I’ve received and devoured Chris Schwarz’s Workbenches book. 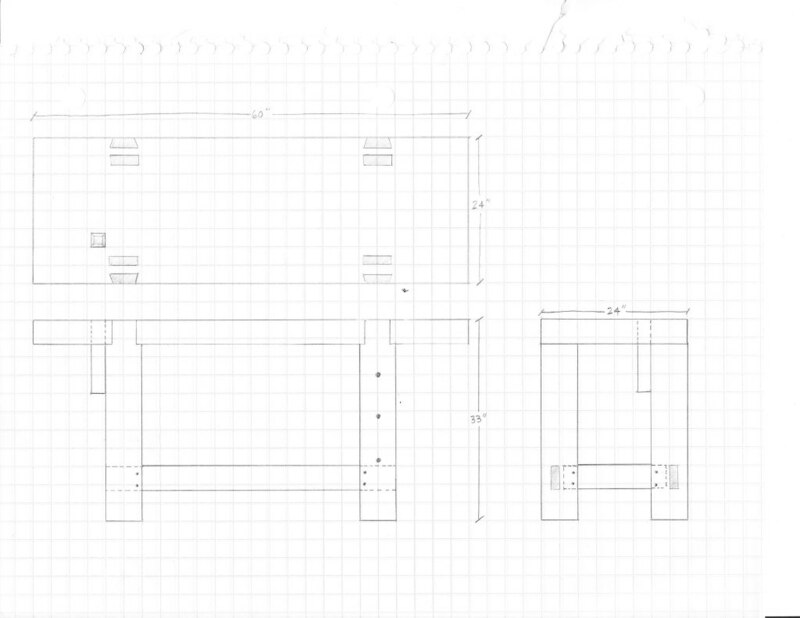 I am pleased to find that I have thought so thoroughly about my bench that I have only had to make a few minor mental adjustments to my plans. I’ve also been following with great interest the thickening plot regarding Schwarz’s Moxonization of his Roubo. It started with him piercing his crochet (ouch!). Where will it end? As I’ve surfed the web trying to see where Chris is going with this, since it may influence my own plans, I’ve stumbled across a couple of others who are already there. Stephen Shepherd shows Moxon’s twin-screw vise and its excellent potential for dovetailing. Others have chimed in on this discussion; Gary Roberts has provided some linkage so you can follow who’s saying what. In short, this vise appears to be a bench accessory rather than an integral part of the bench. You can have it mounted to the front of the bench (but no one seems to know how that was done); alternatively, you can remove the whole assembly, clamp the rear jaw to the bench top and work a bit higher. Since I enjoy dovetailing and plan to do a lot of it, I had already been thinking of making some sort of benchtop dovetail station. Moxon’s arrangement seems to meet my requirements: something higher than the 33″ benchtop; excellent clamping surface; easily removable. I might even tap the front of the workbench itself so I would have the option of screwing the front jaw directly onto the workbench. I suppose that would help for planing long boards on edge; I wouldn’t even really need to have the vise exert much pressure on the board as it would be simply sitting on the screws. I’m not sure where I’d mount the vise at this point (if I tapped holes in the front of the bench), or how wide the jaws should be. In the engravings and drawings, the vise is located on the right front of the bench, but that could get in the way of my wagon vise. I’m considering centering it on my bench. 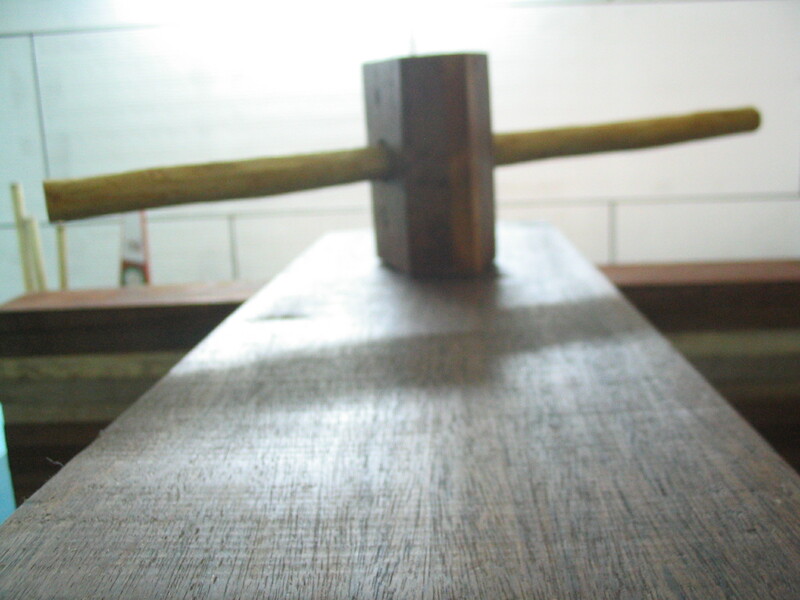 And as to width, what’s the widest you would need for dovetailing – 24″? Of course, all this talk of proper size of the vise is only necessary if you’re mounting it on the front of the bench. 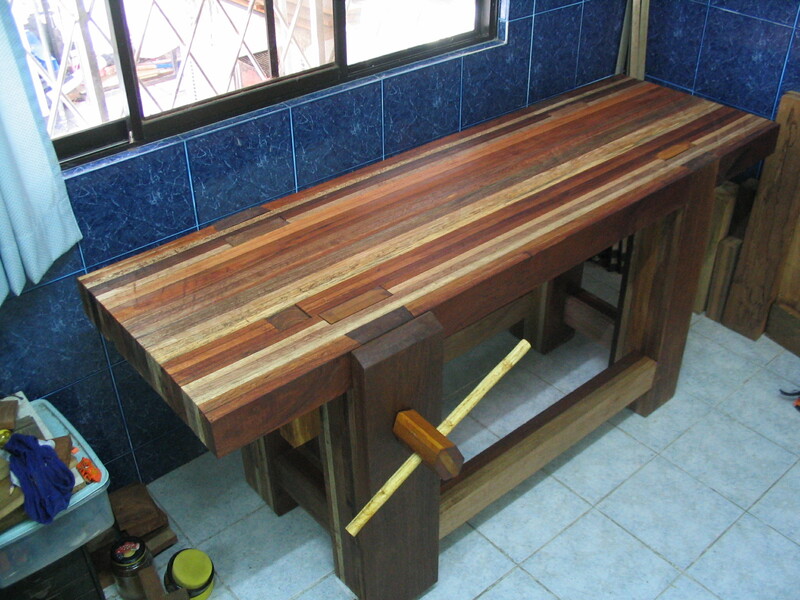 If you are merely clamping it to the benchtop, you can have a vise of any width. If the current one is too big or too small, you can just tap a couple of new holes in a new piece of wood, drill a couple of holes in what would be the front jaw, and you’re in business! If I end up doing this, I think I will also insert dowels into the base of the rear jaw which would tenon into the dog holes to support the vise, perhaps even rendering a clamp or holdfast unnecessary. My apologies for the abundance of text with the absence of graphics. I don’t want to infringe on anyone’s copyright by showing Moxon’s stuff here, and I can’t run Sketchup on my computer (Linux) so I just have to hope that my descriptions work well with the pictures shown on the links above!